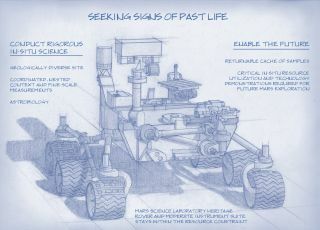 A sketch of the design for NASA's 2020 Mars rover, which will be based heavily on the agency's Curiosity rover. Agency officials will announce the 2020 rover's science instruments on July 31, 2014. NASA needs ideas for its next Mars rover, but the government shutdown might delay their arrival. The space agency has put out an open call, asking scientists to submit proposals for the science and technology instruments that will fly aboard NASA's next Mars rover expected to launch in 2020. If the government shutdown continues, however, the competition — called the Mars 2020 Mission Investigations Announcement of Opportunity (AO) — might not go forward as planned. The newly announced proposal competition asks researchers to submit a mission plan detailing the hardware, mission operations, data analysis and other information about what they would use a rover to investigate on Mars. The total cost available for the investigations is about $130 million. NASA's Mars 2020 rover is expected to look somewhat like the space agency's Curiosity rover currently roaming the surface of the Red Planet, but its job will be different. The 2020 rover is slated to search for signs of past life on Mars and collect samples for an eventual return to Earth, NASA officials have said. Curiosity's initial mission was focused on determining if life on Mars was ever possible. The rover settled that question in March when NASA announced that Curiosity's data shows that Mars could have supported primitive life in the past. "The Mars 2020 mission will provide a unique capability to address the major questions of habitability and life in the solar system," Jim Green, director of NASA's Planetary Science Division in Washington D.C. said in statement. "The science conducted by the rover's instruments also would expand our knowledge of Mars and provide the context needed to make wise decisions about whether to return any collected samples to Earth." The 2020 rover might also help scientists pave the way for a possible manned mission to the Red Planet sometime in the future. "The Mars 2020 rover will test technologies that are key to one-day landing human explorers on the Red Planet," Jason Crusan, director of NASA's Advanced Exploration Systems Division, said in a statement. "New technologies could allow astronauts to live off the land as they explore the ancient valleys of Mars. The capability to manufacture breathable air, rocket fuel, water and more may forever change how we explore space."